Crafted by a top-of-the-line manufacturer for ultimate comfort, this contemporary styled recliner and ottoman set will be the source of un-countable relaxing evenings at home. While a modern style creates a clean-cut appearance with smooth pulled upholstery, padded track arms and decorative back channels, multiple features work together to create an experience of comfort. 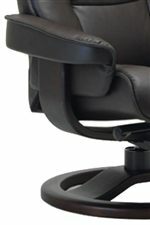 An Active Release System automatically provides an optimal neck and back support while lumbar support is provided in the backrest of all recliners. Complete with welt cord trim and a modern polished look, this recliner and footstool will accent homes with a contemporary office feel and an element of comfort that you'll wonder how you lived without. The Bergen Small Contemporary Recliner and Ottoman with Swivel Base by Fjords by Hjellegjerde at Saugerties Furniture Mart in the Poughkeepsie, Kingston, and Albany, New York area. Product availability may vary. Contact us for the most current availability on this product. Made by a manufacturer who holds house-hold comfort as being of up-most importance, this reclining chair and ottoman collection will give homeowners a chance to experience soft relaxation in the comfort of their living room. Designed with a contemporary style that has a sleek office look, items in this collection feature smooth pulled upholstery and carefully positioned padding for neck and back support that will relax away the day. The Bergen collection is a great option if you are looking for Contemporary furniture in the Poughkeepsie, Kingston, and Albany, New York area. Browse other items in the Bergen collection from Saugerties Furniture Mart in the Poughkeepsie, Kingston, and Albany, New York area.